Think back to when you were a child. Do you recall a waxy vine-like plant that was draped around a room in your grandmother’s house? She probably referred to the plant as a wax plant; I know my grandmother did. 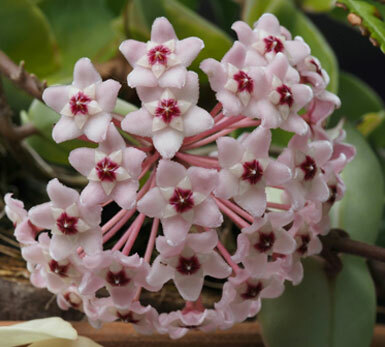 This wondrous tropical plant is actually called a Hoya. It has thick waxy leaves and small clusters of star-shaped flowers that are bright in color with a subtle scent that makes the room small amazing. The blooms of this plant are perfectly geometrical, which is one of the reasons that the plant looks artificial upon first glance. I never knew much about Hoyas; in fact, I only recently learned their true name. They are breathtaking beauties that are in many homes. They are easy to take care of and they add an exotic touch to any home garden. Here’s some of what I’ve learned about this extraordinary plant. There are over 200 species of Hoyas, each of which have unique colors and shapes. This beauty is seen not only in the blooms, but in the foliage as well. Hoyas are popular house plants that often bloom in the first year, but if they are indoor plants, there is a possibility that the process could take longer. Let’s explore some of the specific needs of Hoya plants; starting at the roots of the plant and the type of soil that is needed to help them grow. Soil Requirements – A Hoya plant need soil that is rich, aerated, and drains well. Personally, I create an organic soil mix that really helps my Hoyas prosper and grow. It is made from organic potting soil, compost, worm casings, and fine fir bark. If you have your Hoyas planted in a pot, they like being in close quarters, so transplanting the Hoya into a larger planter may do more harm than good. 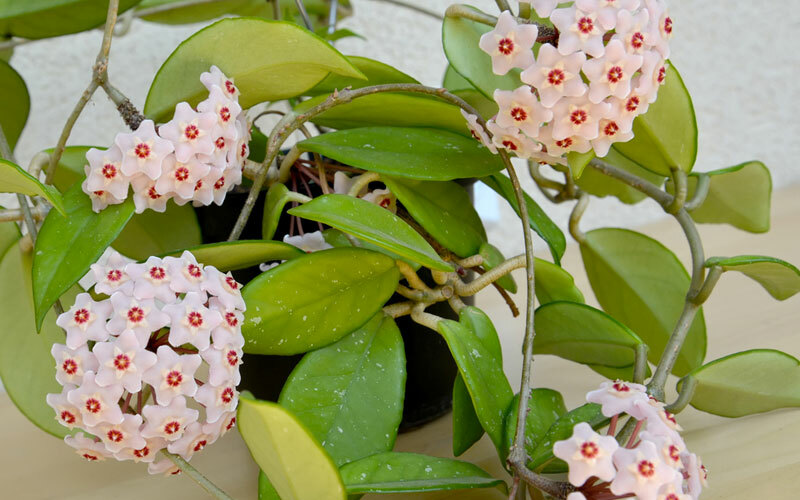 Fertilizer – Like most of the plants that we have in our homes, the Hoya likes to be fed with fertilizer. Use liquid fertilizer to feed your Hoyas about once a month during the growing season. Once cold weather comes along, make sure to cut back on the fertilizer. In fact, these plants should not be fed during the winter months because they enter a semi-dormant state. Water – During the spring and summer, these plants crave water, and they need quite a bit of it to remain hydrated. Water the plant thoroughly, and as long as the pot that it is planted in is a container that drains well, then you shouldn’t need to water it again for about two weeks. Test the top of the soil, if it is dry, the Hoyas need watered again. It the soil is still moist, then you can wait a bit longer to give the plant more water. During the winter months you can cut back on watering the plant. Since it is in a semi-dormant state, the Hoyas can most likely be watered once a month. Light Requirements – Sunlight is important for a Hoya plant, but indirect sunlight is best. Having the plant hanging directly in your window will cause the leaves to burn from the direct heat of the sun. A north facing window provides the perfect light for a Hoya plant, but if you do not have that lighting option available, fluorescent lighting will do the job as well. They prefer morning sun, but if the light is not sufficient, the plant may not bloom. Temperature – These beautiful flowers are tropical plants, so you do not want to keep them in extremely cool temperatures. Try to maintain the room where you have your plants located at a temperature of at least 50 degrees Fahrenheit. Pruning – These long lush plants do not need to be pruned, unless of course they are becoming unruly. I find that the only pruning that is required on a Hoya plant is cutting off dead growth and controlling the size of the plant. If the plant is becoming too long, cut it back and propagate the cutting to give to a friend. Hoyas are vines that can be trained to grow along any path you choose. They can climb trees, hanging planters and the walls of your home. I have seen Hoyas grow to lengths of about 12 feet, but if trained and cared for properly, they can grow longer than 20 feet in length. It is best to train the plant while it is young, but training a mature Hoya is still a possibility, it will just take longer to achieve the desired outcome. Hanging pots are perfect for dangling Hoyas, but if you want the plant to grow upward, place some bamboo in the soil next to it and tie the plant to the bamboo with twine. 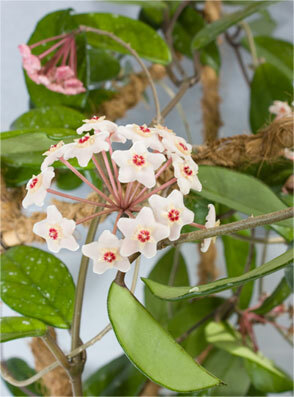 The best way to propagate a Hoya plant is to create a cutting that is at least ten centimeters long. The cutting should have two to six leaves, and it should be removed from the matured plant during the early spring of the year. This allows the new plant to take root during the growing season, which will help it survive. You can place the cutting in water and wait for the roots to form or you can transplant it directly into dirt. Make sure to keep the soil moist until new growth is seen, which means that the cutting has taken root. Transplant the new plant into a small pot; it will be able to live here for two to three years before a transplant is required. Aphids, mealybugs, spider mites, and ants can all be attracted to the Hoya plant because of the sweet smelling nectar. These insects can be sprayed off of the plant with a gentle stream from a hose, or if you prefer, insecticidal soap or spray can take care of them as well. The worst pest that will bother your Hoya plant is the root-knot nematode. These little pests seek out plants in areas that have warm temperatures year round. Locations where there is no fear of frost occurring suddenly overnight. If your Hoyas are infected, they will begin to decline in health. In many cases, these nematodes can be the death of the plant, but you can save it by taking a cutting from the top of the plant ant attempting to propagate it. Hoya plants are one of the easiest houseplants to care for. With proper training and care you can have a gorgeous Hoya vine wrapped around your kitchen in no time. They are exotic plants, but with care and knowledge, you can have a tropical plant in your home.